The Motorola Moto X is obviously coming soon as leaks are starting to pop up like mushrooms after rain. We have seen Motorola’s official teaser, the brand new redesigned Moto logo, now a Google company, and we have even seen the first images of colorful back plates for the device. 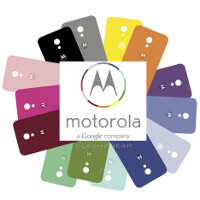 Now, here are neat little renders of the possible colors for the backplates of the Moto X, coming courtesy of SlashGear. The publication based its work on the colors in the new Motorola logo, and of course while nothing is official we know customization will be one of the biggest novelties for the mysterious Moto X. Speaking of mysteries we have to humbly point out that we’ve been bringing you exclusive and consistent reporting about the upcoming Motorola Moto X. In March, we said there would be three new Motorola devices initially and just recently our words were confirmed by leaks for the Motorola RAZR Ultra and RAZR M Ultra, coming in addition to the Moto X. The third device - we predicted - would be oriented at the low end market. As for the Moto X, our source tells us the handset will come in a choice of more than 20 colors, and that it’d feature a 4.3-inch 720p display and run on a Snapdragon S4 Pro with 2 gigs of RAM. Right below, you’d find the renders for the possible color versions of the Moto X.
Meh... still not so convincing enough. and that 4.3 display is little. Why can't people be satisfied with it being midrange? I personally never had high expectations for the device. For the matter, I never have high expectations for any cellphone. I see no point since there is a chance it could always be a disappointment. hyping somewhere to a point where everybody is literally drooling in anticipation (especially with mobiles) always ends in disappointment. 4.3 display is PERFECT, and 720p resolution is good for that size. What's more, it will be affordable. There are already too many 5'' flagships. I'd say Motorola is targeting females with this phone. If the screen is indeed 4.3", then it should be easier to hold in the hand which is a huge complaint by females about these new super phones coming out. Also, the colours seem to look more on the feminine side. I think it could possibly sell well if marketed properly. A lot of females turn to the iPhone for the size also. If this phone is designed with similar traits of the Razr M with a compact body because of the thin bezels, it could be a really good phone. Never mind its an older processor, but 720p @ 4.3" should result in a high pixel density that's more than pleasing to the eyes. 2gb ram is also a plus, the only thing Motorola needs to ensure is that the camera delivers to compete among the best. They've had a bad rep when it comes to their cameras, lets hope Google changed that. well google has never had a good reputation for cameras either... look at the nexus line. @Dinzle Yeah, but the Nexus line was never built by a company owned by Google. What in the end will make or break this device is the sensors aspect. If Motorola can produce something truly revolutionary that makes your phone smarter and more user friendly, they'll be onto something. Hmm I'll take the orange and yellow one.